While Andrea does spend most of her spare time playing music, recently she'e been into books about writing & song writing in particular. She says, "my current iPad read is "Writing Down the Bones" by Natalie Goldberg". Her dream closet consists of Nicole Richie's bohemian-glam style, Vanessa Mooney's amazing jewelry (a designer she says you must check out) or Stevie Nicks. Where does this bohemian glam goddess like to shop? Her favorites (in her words) "Free People (the Sherman Oaks location is my favorite, it's the biggest on the west coast) Fred Segal (when they have their 70% off sale) & flea markets. We have some awesome flea markets here in LA...I love the Melrose Trading Post, & when I have a whole Sunday to devote to picking I'll go the the Rose Bowl". In addition to her styling, beautiful music making & blogging, Andrea is also a talented artist! New woman crush, right!? 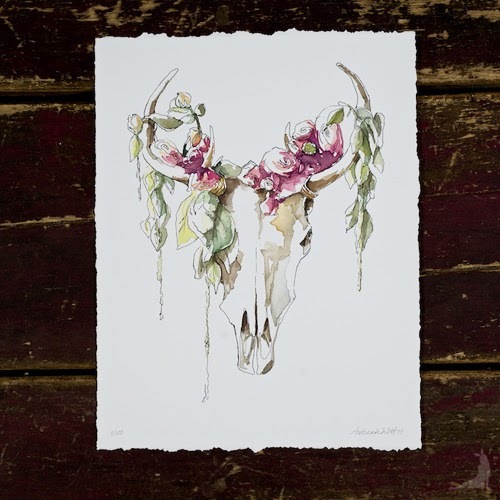 Better yet, oday Andrea is giving away one of her gorgeous prints! Can't wait to check out her blog - she looks/sounds pretty incredible! Thanks for sharing. Love love her piece! So gorgeous!! !